The main thread of Canadian-Armenian filmmaker Atom Egoyan’s latest elliptical narrative is a boy’s search for the truth about his parents, the victims of a tragic car accident that happened years ago. But, in true Egoyan style, the film veers off from this central thesis into a Rubik’s cube of variations. In fact, Egoyan packs so much serious thinking into the crevices of the initial coming-of-age story that even though we may be left with our intellects stimulated by all these ideas, we also end up overwhelmed by the scope of Egoyan’s exploration, including even his exploration of the variety of means he uses-cell phone videos, narrative flashbacks, the virtual world of the Internet, even a variant of deus ex machina-to present these ideas to us. 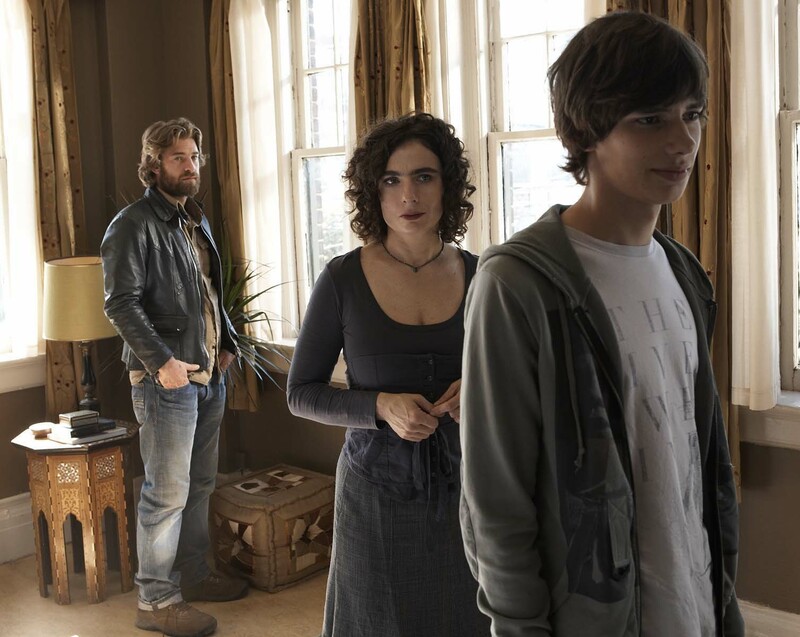 Fifteen-year-old Simon (Devon Bostick) lives in a working-class suburb of Toronto with his uncle, a relatively low-key tow-truck driver who nonetheless harbors some deep-seeded anger-management issues (Scott Speedman), that we soon realize stem from the same source as Simon’s confusion. The boy’s grandfather, dying in hospital, is a nefarious old bigot who fills Simon’s head with lies about Simon’s father, a Lebanese immigrant whom the grandfather obviously despised long before the car crash, which he infers to Simon was a deliberate act of double suicide on his father’s part. (But here I begin to wonder if I remember correctly. Adoration‘s timeline is so fractured that I can barely remember when relative “truths” are revealed.) With the encouragement of his French teacher Sabine (Egoyan’s wife and constant muse, Arsinée Khanjian, in a difficult role that she handles with her usual sangfroid), Simon decides to make up a story about his dead parents for a drama class project, based on an old news story from the ’80s about a Jordanian man who planted a bomb in the purse of his pregnant Irish girlfriend before she boarded a flight to Israel. Simon takes this true incident of a thwarted terrorist attack, and makes it the story of his own parents. His school performance is so realistic that his teacher persuades him to act as though his own story is true. Simon is perplexed but willing, even elaborating his fabrication to friends in Internet chat rooms. The made-up story quickly goes viral, and Simon finds himself at the center of something much more complex than he, or Sabine, ever imagined. We are led through various subjective versions of the truth about Simon’s parents, a fascinating mystery constantly shifted by ubiquitous internet chats, of course, but also by need, anger, resentment, and later, even tolerance and acceptance. Egoyan is at his most provocative playing with these extremes of perception, and he deftly engages us not only with the most radical of beliefs (terrorism as an act of faith), but even with the most clichéd of images, that of a man and woman lying in bed together, young and in love. How Egoyan manages to be brazenly sentimental without diminishing these intellectual provocations is a talent that I find particularly intriguing. He’s like Godard that way, unafraid to unleash the sheer mournful beauty of an orchestral string accompaniment to a sensual image after a particularly rigorous argument about the nature of cultural compatibility, or how religious totems change their meaning when taken out of context. Unfortunately, the final solution to the mystery behind Simon’s parents’ deaths, as well as the one behind Sabine’s own meddling into the boy’s life, feels contrived, and is not nearly as satisfying as the ruminative journey Egoyan took in getting there. Once solved, the Rubik’s cube looks banal. Still, we can’t help but get the distinct impression that Egoyan is a dedicated humanist as well as a masterful stylist. The exquisite beauty and poignancy of The Sweet Hereafter came from the same source, and even though its brilliance outshines Adoration, we can sense the same craftsmanship at work. And the same longing for understanding and connection, the same anguish when they fail us. Underneath a boy’s search for meaning is Egoyan’s larger agenda, and that is a search for acceptance and tolerance, both among different cultures and within the social microcosm of the family. Adoration‘s ending may feel a little too artificial, a little too idealistic, but there is still something lovely about where these people end up.